Weeding occupies a major amount of time in landscape maintenance. Opportunistic nuisance plants pop up between ornamental plants with incredible regularity. Different types of weeding require the gardener to address the situation based on the amount of unwanted plants, time of growth and use of herbicides. Like all plants, weeds require water, sunlight and nutrients from the soil. Using various type of weeding helps eliminate weed competition with landscape plants. The current trend of organic gardening promotes the use of sweat and hard work to remove garden weeds. Cultivation introduces no chemicals to the garden environment. This method of weed control requires certain tools to make the task easier and more effective. Gardeners use a small shovel called a trowel to dig individual weeds. A hand cultivator looks like a small three-tined rake and tackles weeds around existing plants. The long-handled hoe also works well to scrape juvenile weeds from the soil surface without bending. 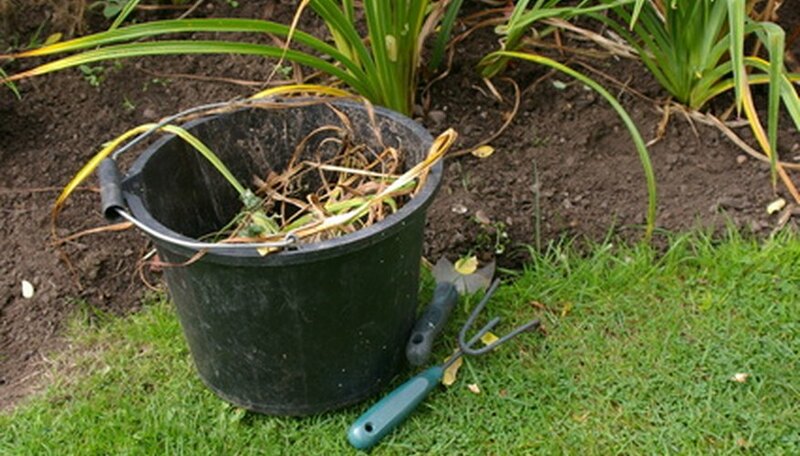 Gardeners pull weeds by hand regularly to continually maintain the appearance of the garden. Cultivation also includes the use of a tiller to turn over the soil and chop up existing weeds. Pre-emergent herbicides tackle weed problems before the nuisance plants appear above the soil surface. This type of weed killer must be applied to the garden surface, preferably after planting annual or perennial plants. Mulch the garden surface and sprinkle granular herbicides on the garden surface. Water the garden after application to allow the herbicide to penetrate into the soil. Always check the label to verify the safety of pre-emergent herbicide application in an existing ornamental flowerbed. Gardeners use Roundup with great abandon around the home landscape. Glyphosate-based herbicides such as Roundup attack weeds as the plants appear above ground. The problem lies in the inability of the herbicide to tell the difference from a desired and undesirable plant. Glyphosate herbicides soak into plant leaves and travel into the plant roots for complete systemic weed control. Post-emergent herbicides require the plant to be in an active growth stage for effective results. This type of product works best on perennial weeds that infest the garden every year. Another type of weeding incorporates a more organic approach to preventing weeds. Gardeners use mulches to restrict access to the sun for weed seeds. A thick 3- to 4-inch layer of mulch on a troublesome garden bed often smothers weeds before the plants reach maturity and form seeds. This method offers some resistance to weeds and should be paired with regular cultivation to keep weeds under control. Fine mesh weed screens placed under a mulch layer will smother weeds for a season or two. However, these opportunistic plants find a way to germinate above the weed screen layer eventually. Mulches help control the situation to make the weeding task more manageable for the gardener.